It has been another busy week in school. As I type this the PTA are all busy preparing for the Summer Fayre. They are still trying to decide whether to have it indoors or outdoors but regardless of the weather I will be outside as I am helping to run the 'Bouncy Castle'. I must take note of the stalls that are moved indoors if it rains because I will volunteer for that stall next year. Working at the Summmer Fayre means that I will have spent three evenings at school this week. On Monday we had our Governors committee meetings and on Tuesday the Rotary Club held their presentation evening for all the people who took part in their sponsored swim event back in March. I felt very proud watching this event because they raised over £5000 and a large proportion of this money came from people at Little Heath. I would personally like to thank all the people who took part and I hope that even more people take part next year so even more money is raised and then donated to worthy causes. Nursery invited me over this week to watch them do some face painting but, typically, you are not allowed to be an observer in nursey for long and soon they were painting me. 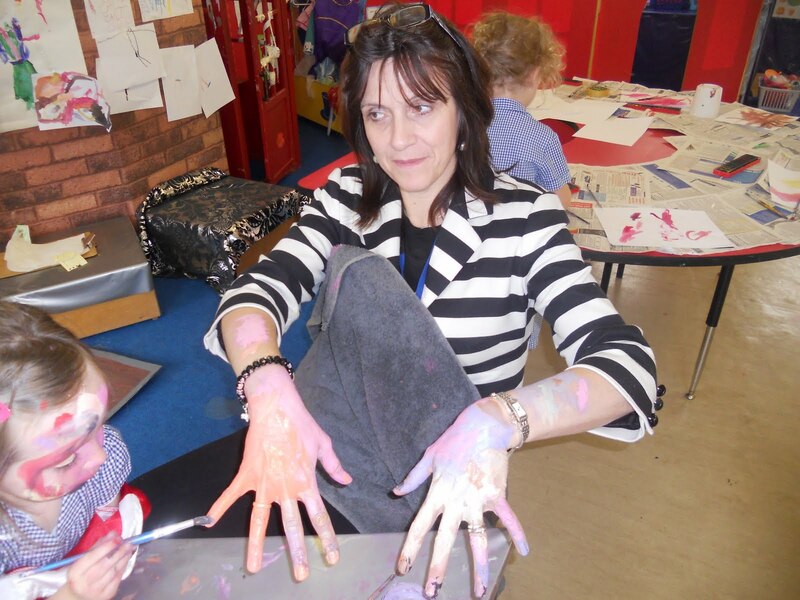 They could not do my face as I had to meet some visitors that day so I agreed to them painting my hands. However ,as you can see from the picture, they also painted my arms and I counted myself very lucky to escape without been given a full body paint. As you have probably heard from your children next week is 'Health and Fitness'week in school. Extra activities that we will be running for the children are obstacle courses, Zumba classes and meditation sessions. Lets hope the children ehjoy them whilst learning how to take better care of themselves. I must go now and change in readiness for my stint on the Bouncy Castle. I hope next week that I can report that the fayre was very well attended and lots of money was raised for the school. I hope we do because the PTA really do work hard to raise funds for resources for all the pupils at Little Heath and these resources really do have a positive impact on their learning.